Joseph Sieracki was born and raised in Cleveland, Ohio. There he earned his undergrad at Ohio University and his master’s degree at Cleveland State. He is currently teaching in a suburb of Cleveland, residing with his wife, daughter, and dog. 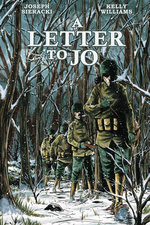 A Letter to Jo is his first graphic novel.